In Bethany we visited the beautiful little church built next to the tomb of Lazarus. Visiting Bethany has become much more difficult since the Israeli government has built a separation wall which now runs between this village and Jerusalem. The colorful mosaics inside the church of Lazarus in Bethany recount the amazing events that took place there, including Jesus' powerful statement, "I am the resurrection and the life" just before raising Lazarus from the dead! The massive ruins of the Constantinian Church of the Ascension on the Mount of Olives now enclose a lovely garden where Jesus' teachings overlooking the city of Jerusalem are remembered. Inside the Church of the Ascension we reflected on Jesus' mysterious and hopeful teaching about the end of the world and God's final victory over sin, death, hell, and the devil. 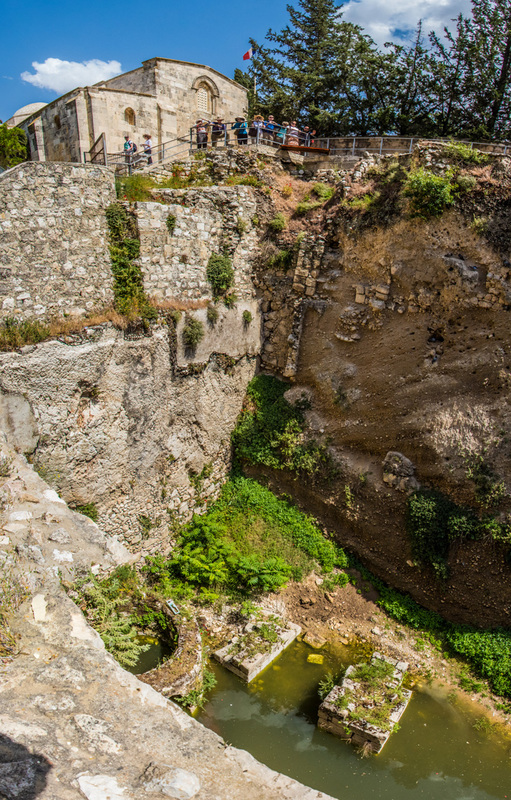 At the Pools of Bethesda we were able to distinguish between the pair of huge water storage pools (seen here) and the smaller pools nearby which made up a pagan healing shrine where crowds of people were hoping to be healed. We reflected on the provocative implications of Jesus entering such a pagan context and the amazing grace of his healing a man who expressed no faith in or knowledge of Jesus! We concluded our visit to the Pools of Bethseda with a visit to the beautifully preserved thousand year-old Church of Saint Anne and enjoyed the ringing sounds of its perfect acoustics by singing a worship chorus.